In a mixing bowl combine butter and sugar. Beat until light and fluffy, about three minutes. Add egg and mix. Add 1/2 cup milk, orange extract, orange zest and juice, and vanilla. Beat until well mixed. Add nutmeg and mix. In a separate bowl combine flour, baking powder, and salt. Slowly mix flour mixture into the wet ingredients until you get a smooth, soft dough. Chill 1 hour. Preheat oven to 350 degrees. Line four baking sheets with parchment. Take a golfball-size bit of dough and roll into a long rope. Cut the rope into 3/4-inch rectangular pieces. Place milk in a bowl and sesame seeds in a separate bowl. Dip the cut cookie pieces into milk, then roll in sesame seeds. Place on prepared baking sheets. 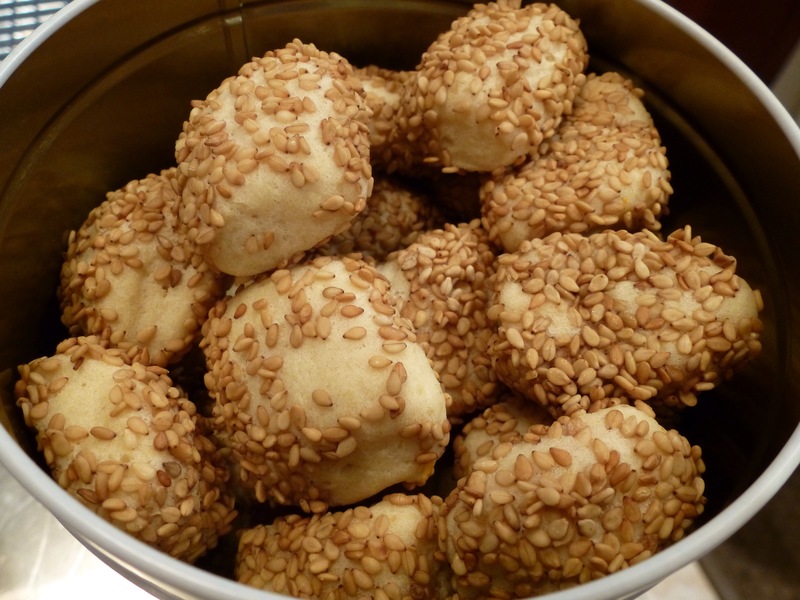 When you have filled a baking sheet, bake for 10-15 minutes until sesame seeds have darkened slightly and cookies are somewhat firm to the touch. Repeat with remaining dough. Cool on racks. Store in metal tins for several weeks. Makes 100 cookies. Note: A nice variation on this cookie is to eliminate the orange and add zest of a Meyer lemon and lemon emulsion or extract. Roll the cookies a little thinner and shape them into a horseshoe. Dip in milk then crushed sliced almonds before baking for 15 minutes at 350 degrees.